This list is obviously quite self-serving - all items are achievable with Brightcove, either out of the box, with partners or with custom development via Professional Services, or some combination. But these themes are universal and could be applied to any online video business that has outgrown YouTube or Blip.tv. If you have global rights, it's possible to expand your audience multiple times over by making video content available in additional languages and promoting it accordingly. Closed Captioning as a Brightcove player feature is possible via custom Flash programming, or as part of a Brightcove Pro Services engagement. Transcription and the creation of the titles themselves is the most challenging element here. A Brightcove partner such as DotSub can help, with a network of thousands of titlers around the world. Whether you like it or not, there are a lot of people that watch and, more importantly, search for video on Google's little video site. Use a service such as TubeMogul to upload to Brightcove first, then upload all of your videos to YouTube automatically. Or, if you have time, try uploading short preview for your long-form video as a means of promotion back to your own site. If your rights allow it there's no excuse to miss out on iPhone and iPod Touch playback, or Boxee for that matter. You can do marvelous things with MRSS and H.264 playback. We even gave away some code for to format your library for the iPhone. I remember way way back, in 2005 or so, when limiting traffic - DRM and off-site playback - were more common topics of conversation than traffic growth. Looking back we all were so silly. Viral distribution can be a very effective tool for expanding audience. With Brightcove, you can customize your viral distribution player to be different than the player from which the embed originated. This can be an effective way to brand your viral player, outside the playback area or with a clickable watermark on top of the video. Analytics services such as Visible Measures and TubeMogul can help track, in detail, where your playback occurs. Our talented Art Director, Jeremy Merle, has a great post on player customization, including watermarking and viral customization. If you have a text-centric site with articles or pages, try to embed videos on as many of those pages as possible. You can drop a Brightcove template into your Content Management System, use instances of that template on your articles, and populate a title ID dynamically. 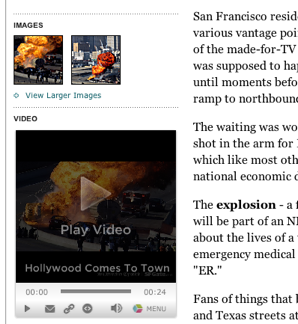 Check out the explosion video on SFGate.com (right) for a good example of an article embed. Comments and ratings are proven tools to get people to watch more videos or come back for more. Partners such as Pluck and JS-Kit make it very simple to use. Check out JS-Kit in action on sites such as Channel Sun. What are people watching? When are they watching? On what pages are they watching? How long do they watch before changing videos or leaving the site? These are questions that absolutely every mature video business must understand on a daily basis. Knowing your audience will inform your advertising, editorial, distribution and production decisions. And there are lots of choices out there. With Brightcove 3 there are many ways to more deeply understand your audience. My one-liners below are meant to oversimplify what I see as differentiators for some of our wonderful partners. There is obviously a lot more nuance. Brian, Brett, Jason, et al, please feel free to comment to add more color. Visible Measures - Advanced video analytics including visual abandonment stats. No custom dev work required for integration. TubeMogul - Unified viral distribution stats. Google Analytics - It's free. We've got it well documented. And you are probably already using GA. Flash video players hide your video metadata from Google and other search engines (except for AOL's excellent Truveo vide search). There are two great ways to work around this limitation while maintaining a great user experience. For more information on SEO and Brightcove, please check out the oft-quoted white paper. 1. Google Sitemap. You can output your Brightcove metadata via Media API and transform it into Google's sitemap format. There's an old article on the subject here and a new one on the way soon. I'll update this post accordingly. We've done a bunch of these now in Professional Services. 2. If you don't have the means to generate a sitemap, hosting an MRSS feed for your videos may help site crawlers to index your video content. Pages run on your domain, within your site framework. A little server-side code - in Java, PHP or ASP.Net - are all that's required. Weather.com - Prominent display, front and center. Clear Play buttons. 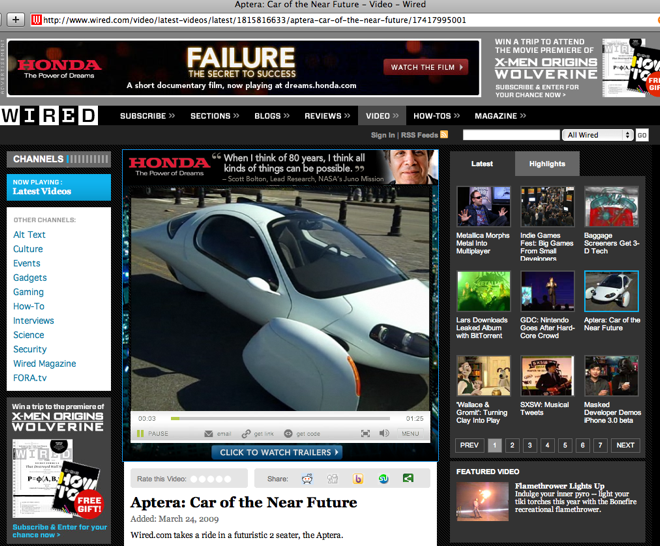 Wired - Below the fold, but they put an actual video on the page. The New York Times - Custom player with on-page playback and a few other choices, with links in to the video library.